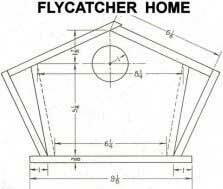 Build a Flycatcher bird house with free plans. With 400 species of Flycatchers, this little guy can be found from the Canadian north to the tip of South America. These medium size, insect-eating birds often use abandoned woodpecker nests or cavities in trees, but you can build a nest that may attract these prolific bug-eating birds to help keep your property's insect population under control. Easily built using scrap lumber, you should leave the structure unpainted. You may wish to build the bottom so it can be removed to clean out the house at the end of the birds' tenancy. It should be mounted between 8-feet and 20-feet high on a tree at the edge of your property. The flycatcher house has a 6.25" x 7" floor, 10" long roof and an entrance hole about 5.25" above the floor. Build one with these free plans and start birdwatching!